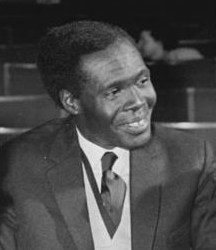 Apollo Milton Obote (28 December 1925 – 10 October 2005) was a Ugandan politician who led Uganda to independence in 1962 from British colonial rule. Betweeen 1962 to 1966, Obote served as Prime Minister of Uganda. He also went on to serve twice as President of Uganda from 1966 to 1971 then from 1980 to 1985. On 10 October 2005, Obote died of kidney failure in an hospital in Johannesburg, South Africa, aged 79. ↑ Gideon AJ van Dyk (18 March 2016). Military Psychology for Africa. AFRICAN SUN MeDIA. pp. 379–. ISBN 978-1-920689-95-7. ↑ Leslie Alan Horvitz; Christopher Catherwood (14 May 2014). Encyclopedia of War Crimes and Genocide. Infobase Publishing. pp. 331–. ISBN 978-1-4381-1029-5. ↑ "Former Ugandan leader Obote dies". BBC News. 10 October 2005. Retrieved 19 May 2016. Wikimedia Commons has media related to Milton Obote. This page was last changed on 12 July 2018, at 06:59.